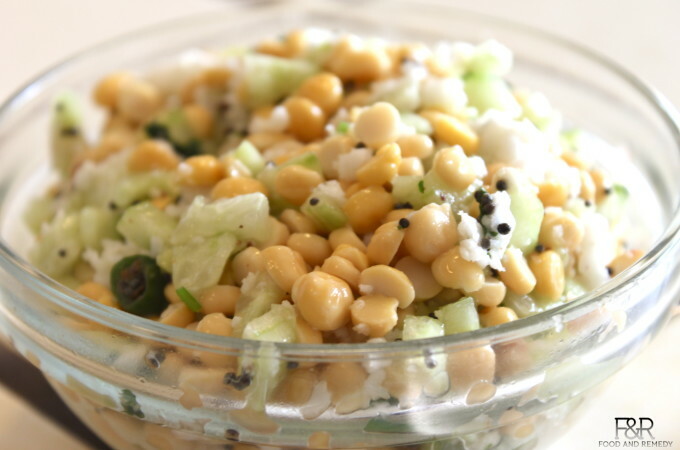 This salad or kosambari is traditionally prepared on the festivals days in Karnataka.ALong with the festival being, it is a healthy salad which is high in protein and fiber, can be included in the everyday meal. Heat the oil in a ladle, and wait for the oil to reach the right temperature. To check this, add a small amount of mustard, and it should start cracking/popping. If it is at the right temperature, add the mustard seeds, asafetida, cilantro, and chilis. Let everything sit in the oil and stop crackling heavily. Add this seasoning to the soaked channa dal, and add the rest of the ingredients as well — the cucumber, coconut, and salt. Mix this evenly, and enjoy!